WARF's newst project is up and running, in association with The Forest Fire Control Division, Chiangmai Flying Club together with NOK Flying Club pilots and members are invited to participate in reporting outbreaks of forest fires in Chiangmai and Lamphun Provinces. This information should be passed to the Forest Fire Control Division (DNP) in Chiangmai – Hotline 1362 - who will take appropriate action. Reporting forest fires please call Chiangmai DNP office 053-276100 Ext. 11 during office time or our hotline 1362 round the clock. Forest fires should be reported by all members of the public to the DNP as soon as possible, giving location, time of observation and extent. Pilot’s observing forest fires from the air should ideally give GPS coordinates and geographical location. Chiang Rai: Authorities are unable to establish the cause of a fire that destroyed the Doi Tung Development Project's forest areas, covering more than 2,000 rai. The fire, which has now been brought under control, occurred near the Doi Tung Royal Villa, where the late Princess Mother resided. Police have come up with a number of theories about its cause. M.R. Disanadda Disakul, director of the Doi Tung project in Chiang Rai's Mae Fa Luang district, said the damage caused by the fire has been the most extensive in years. The blaze devastated more than 2,000 rai of forest area, which was home to large, priceless teak trees, and pine trees aged more than 20 years. Pol Maj-Gen Songtham Alaphat, Chiang Rai's provincial police chief, said police had investigated more than 60 suspects. He said evidence showed that the forest fire was caused by arson. 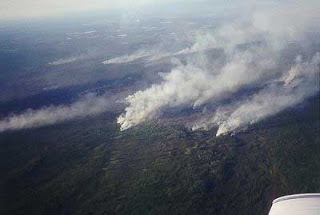 Investigators suspected the fire could be linked to either a conflict involving the project officials, or drug cartels which burned the forests in a bid to divert the attention of authorities from their smuggling operations, Pol Maj-Gen Songtham said. A 52-year-old Air Force veteran has embarked on a 500-kilometre "walk for reforestation" in honour of His Majesty the King. Flight Sergeant 1st Class Pramuan Peungsuriyawong hit upon the move after his request to replant the degraded 300-rai Dong Mun Forest was turned down by the Forestry Department on grounds that the area was situated within the 2,300-rai Dong Mun National Forest Reserve. Pramuan left his home in Bangkok's Chom Thong district on April 4 for the Dong Mun Forest in Kalasin's Tha Khantho district, in hopes that his march would raise public awareness and participation in reforestation. Carrying a shoulder bag and a folding tent on his back while wearing a T-shirt saying, "Love the King, Love the Forest," Pramuan had already hiked 500 kilometres to Ban Samjan in Khon Kaen's Muang district as of yesterday evening. He was expected to reach Kalasin's Tha Khantho district 70 kilometres up the road today. Throughout Pramuan's 12 days of trekking, sleeping by the road and developing blisters, people asked him where he was heading, and after he explained his goals, many offered him food and water, while some even gave him a little money for reforestation efforts. Donations now total Bt2,000. The Bangkok native said he had served as a military mechanic before making friends with Phra Ajarn Niran Khunnatharo, abbot of Wat Thamnamthip in the Dong Mun Forest, in 1992. Noticing that villagers had destroyed the forest by burning trees to grow tapioca, Pramuan decided to quit his job in 2000 and dedicate himself to the cause of reforestation for the sake of the Kingdom. Together with some schoolmates, he built weirs to irrigate the forestland and underwent training on ecofriendly organic agriculture so he could teach it tolocals and stop them from razing forestland for tapioca farming. In January, Pramuan - reportedly with local villagers' support and forestry officials' initial agreement - submitted a request to the Khon Kaen Forestry Office to plant trees on 300 rai of the forest, he said. But the matter became stalled, and he was eventually told he must do it in accordance with proper procedure, which he did not know, he said. After that, officials told him he could not take care of the area, because it overlapped with the temple's land. Pursuing the matter at the Regional Forestry Office, Pramuan said two explosions and the burning of sugar-cane plantations during the daytime had damaged the forestland, as well as trees he had been raising for a decade. He went to Government House on February 22 to appeal his case but was ignored, so he turned to acting national police chief Seripisut Temiyavej, who took up the case and promised to send officers to investigate as soon as he reached the Dong Mun Forest. Pramuan also urged the prime minister to assist by allocating land for poor locals, building sluice gates, providing tree seedlings and supporting market channels for organic farm products, so that residents of five nearby villages could make a decent living and stop encroaching on the forestland. Next week, he will follow up on the progress of his request at the PM's Office and the Natural Resources and Environment Ministry. If it goes nowhere, he will lay a protest wreath in front of the ministry and consider petitioning the Administrative Court, because officials have neglected their duty to protect the Dong Mun National Forest Reserve. Manopat Huamuangkaew, chief of the Conservation Department's Region 8 office, said he had just taken up his post five days ago and so did not know about Pramuan's request to restore part of the Dong Mun National Forest Reserve. But he said there should be no problem if the request followed proper procedure, and his objective was to reforest the area. Manopat said he would check to see whether permission could be granted to Pramuan but that if the area in question had already been given to the temple, then the forestry authority could not give redundant permission unless the project was changed to a joint reforestation effort, he said.